Have you ever heard of the miracle of turmeric root and its range of different benefits for your dog? Whether you have or haven’t, you are about to rock your dog’s world with golden paste and all the wonderful benefits it can have on your dog. It can help alleviate pain, reduce inflammation, put a stop to the growth of cancer, reduce the effects of Alzheimer’s, clean their teeth, get rid of allergies, and more! Throughout this article, we are going to provide you with a number of different golden paste recipes and let you know how they can benefit your doggo. Premium quality Turmeric for Dogs chewables with coconut oil. Great for Hip/Joint Health, Arthritis Support & Healthy Digestion. Wondering How to Use Turmeric in Food? Make Turmeric Paste for Dogs! Golden Paste Benefits are Amazing! How to Make Turmeric Paste or How to Make Golden Paste? It’s really Easy! Turmeric Paste for Golden Milk? What is Golden Milk? Golden Milk for Dogs: Is it Safe? Is Golden Paste for Humans or Animals? Are all Turmeric Paste Recipes Safe for Dogs? What kind of Turmeric Should I Use to Make Golden Milk Paste for Dogs? Define Turmeric? It is Pure Gold! If you are wondering more about Turmeric and golden paste, check out our article Turmeric for Dogs! What’s a major benefit of using golden paste? What’s the main ingredient in making a golden paste? Does golden/turmeric paste help alleviate pain? So, you’ve heard the benefits of turmeric and how it has powerful anti-inflammatory ingredients, but how do you give it to your dog? Easy! Many dog owners make a turmeric paste to feed it to their furry friends, and the results can be amazing. Not sure how too many a turmeric paste? Not to worry, we have you covered throughout this article as we are going to show you a number of different ways to add turmeric to your dog’s food. Turmeric is safe for your lil’ pup and makes the best supplement in their food! Many dog owners have claimed that golden paste, or commonly known as turmeric paste, has worked wonders on their furry friends and they swear by the recipe. What makes a golden paste so popular is the many benefits it has and the various conditions, diseases, and part of the body it affects that result in dogs living a happier and healthier lifestyle. Check out some of the benefits of turmeric below. Turmeric golden paste is actually really easy to make and it won’t take up much of your time. That and your furry friend will thank you for it! And that’s it! Easy isn’t it? With very little ingredients you can make a turmeric golden paste that will have incredible benefits for your doggo. Follow the steps in SimpleWag’s infographic below to make turmeric golden paste. The turmeric golden paste that we showed you above is the most common recipe for dogs. However, all dogs are different, and the recipe above might not work for your furry friend. As there is no golden rule as to what turmeric paste you have to give your dog, you can experiment with the different types of pastes that are available to make and find one that best suits your dog. Turmeric can come in the form of a turmeric root or organic turmeric powder. If using the root, make sure it is washed and you use the correct amount of the recipes provided. Turmeric golden paste is best when made with black pepper, and is even better when you add the active ingredient of cinnamon or honey to the paste. After you have all of your ingredients ready, follow the steps below to make golden paste recipe with cinnamon. Grab a small pot and place add the turmeric and the water. On a low heat, stir for 7-10 minutes until ingredients turn into a thick paste. Add the coconut oil, grounded black pepper, cinnamon, and ginger. Stir until everything is incorporated. Leave to cool then put in a glass jar in the fridge for use. Grab a small pot and place add the turmeric powder and the water. On a low heat, stir for 7-10 minutes until ingredients turn into a thick paste. Add the coconut oil, grounded black pepper, and honey. Honey is for the added taste, so add as much as you’d like. Stir until everything is incorporated. Want to clean those teeth and get rid of that smelly breath? Try turmeric toothpaste on your dog! You can use either virgin or organic coconut oil and turmeric powder to create the toothpaste. For added effect, add parsley to act as an antibacterial agent and kelp to remove the nasty plaque from your dog’s mouth. Does your dog suffer from itchy skin, painful allergies, and inflammation of the skin? Turmeric golden paste can help fix that problem! One of the reasons golden paste is so popular amongst dog owners is due to its anti-inflammatory effects and its incredible health benefits. 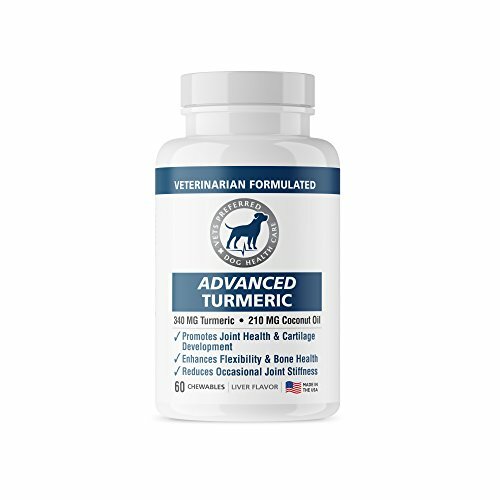 Nobody likes to give their pup anti-inflammatory drugs, and turmeric can eliminate that as it has active agents that target inflammation, pain, and skin irritations. Any of the golden paste recipes above will work great as each contains turmeric. If your dog isn’t big on the thickness of the paste, then you can try them on golden milk, or commonly known as turmeric milk. It has all the same benefits as a paste, but the milk acts more like a drink than something you mix in with your dog’s food. The easiest golden milk recipe is to buy some goats milk (never give your dog cows milk). Add a teaspoon of turmeric and some honey (for the taste). The best time to give this to your dog is at night time as it helps to wind them down. Yes, it is safe to give your dog golden milk as an alternative to the thick golden paste. However, when giving your dog golden milk don’t use cows milk as it contains lactose which can be harmful to your dog. Use goats milk. Turmeric is great for a lot of things, but if your dog has a history of thin blood or is on medication to thin out their blood, then consult your veterinarian before giving turmeric to your dog as it is a natural blood thinner. Cancer is a horrible disease and it’s heartbreaking that it affects dogs as well as humans. Tumeric, however, can help when it comes to cancer. Turmeric has healing properties that have been known to block the cancer cells in dogs that are suffering head or neck cancer. In some cases, it has also been known to shrink tumors. There are many different opinions on the wide web that suggest the correct dosage of golden paste for your dog. As a rule of thumb, it’s always best to start them off with a small dosage of ¼ teaspoon of golden paste to see how they react and what their tolerance is. As golden paste leaves a dog’s system quickly, it’s best to add a ¼ teaspoon to every meal. If you find that they can tolerate the ¼ teaspoon but the dosage isn’t strong enough, then you can increase it to ½ teaspoons. Every dog is different so it’ll be trial and error for the first week. While it’s completely okay to give your dog golden paste, there are some that you should avoid giving to them. It is not recommended that you give them human golden paste, as a lot of the recipes involve ingredients that are harmful to dogs or might cause them to react badly. Golden milk for humans is an example of this as it has lactose, so it’s best to keep to golden paste dog recipes. Golden crackle paste where the paste dries and acts like a biscuit for your dog. Golden molding paste where you put the paste in a silicon mold overnight and can create little chews for your dog. Golden harvest wheat paste to target skin irritations. You can get golden pastes for cats, however, make sure it is the right recipe and dosage as a cat and a dog are biologically different! Both! That’s the awesome thing about golden paste, it’s for humans and animals and has incredible benefits for all species. Not all are safe as some human turmeric pastes can have ingredients that are harmful to dogs, so make sure to check before you make it for them. Made a choice and you want to make golden milk paste? Great! Regarding what type of turmeric you should make, it is recommended you use turmeric powder as it will dissolve in the goat’s milk. Turmeric has anti-inflammatory properties and health benefits that can completely change your dog’s outlook on life. With an active ingredient that targets multiple problems that a dog may suffer, and alleviating more of the symptoms with quick results, who wouldn’t call it pure gold! If you think that golden paste is right for your dog, then there are a number of different choices as to how you can give it to them and potential benefits. They’ll thank you for it!